One of the bits of restoration work that went into The Alice Howell Collection DVD set was creating new main titles and credits for some of the films. Where possible. And that happened in varying degrees, depending on the studio. I was able to access frame grabs of Century Comedies from 1920 to use as a basis for the new ones I created for Neptune’s Naughty Daughter and In Dutch. There’s no way to know, currently, what Century main titles looked like in 1917 and 1918, but the style didn’t really change much during the 1920s, from looking at the few instances that survive. Allen Perkins did the titling work on Father Was a Loafer (1916), and had the main title, credits, and intertitles (actually called sub-titles during the silent era) from the other two L-Ko’s on the set as a basis. The Reelcraft shorts were another story. Each of the five Reelcraft shorts on the set’s disc 2 survive only in 16mm home use rental prints. Some of them have the original main title, some have original credits. None of them look the same. 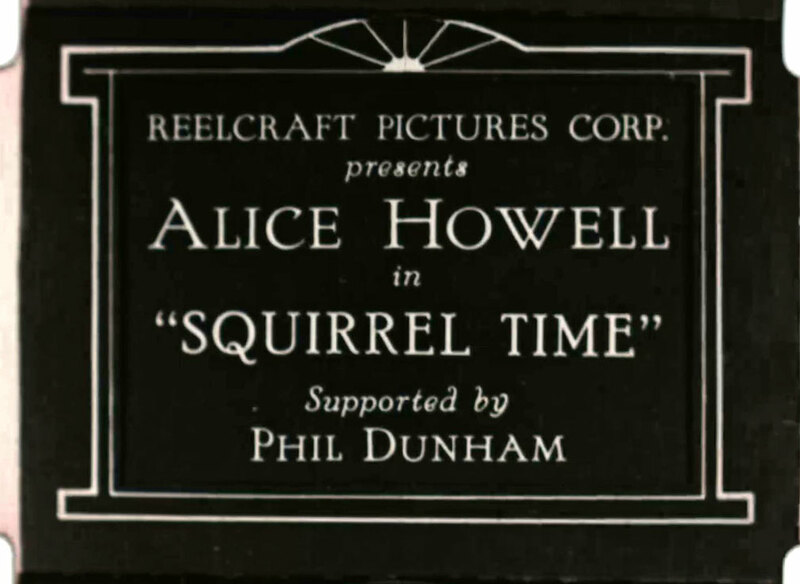 And only one of them looks like the opening title and credits on Squirrel Time (1920), another Howell short that survives in 16mm at the Library of Congress but which was too distressed and warped to be used for the project. Frame grab from the sole surviving print of Squirrel Time (1920) starring Alice Howell., a 1930s 16mm rental print from the Mogull Bros. library, part of the Prelinger Collection at the Library of Congress. The rest of this 16mm was too warped and shrunken to be included on the DVD set. A couple of the films that have main titles that say “Reelcraft presents” that look like they’re from the time the film was released, but also look a little like they might be reissue ones, but it’s pretty doubtful these films were reissued during the 1920s. Cinderella Cinders has a main title that also looks unlike those from the other shorts, and no credits. It was sourced from Blackhawk Films’ 16mm printing negative, and there are no records as to Blackhawk’s (16mm) source material. So, what to do about these shorts? It’s something Allen and I went back and forth about. The tricky bit was that the main titles and credits from three Reelcraft shorts that definitely looked original did not resemble each other either. One dissolves into a still photo of Alice, one dissolves into a live action shot of Alice bowing to the camera, and one has artwork not seen in any of the other shorts. And maybe the main title card for Cinderella Cinders is original, with its artwork a nod to the ancient storybook tale of Cinderella. Reissue titles don’t usually have that much care any artwork put into them. Certainly not for a states-rights Reelcraft short. One way to go, and it is one of the ways to go, was to leave the titles as they were in each of the prints. And that’s what Allen and I went with. The amount of time it would take to remake all of the titles and credits to be uniform was too great, and besides there was the fact that there was no one consistent style to go with. And so we kept the titles intact, as is. It does appear that Reelcraft could not make up their mind, and perhaps were trying different things for Alice Howell’s comedies as she was one of the bigger (biggest?) stars for Reelcraft. Could be right, could not, but there’s no way to know — not without owning a functioning time machine.